General information about dependencies can be found here. Multiple filter expressions are linked together with "Join". With an AND join, only data records that fulfill all criteria are returned. With an OR join, data records are returned that fulfill at least one of the criteria. You can see the application structure with all data fields here. Here, you can see all data fields whose value should be compared with the value of the triggering control.In the "Data group" column, the data group, where the data field originates, is shown. Move a data field from one list to the other. 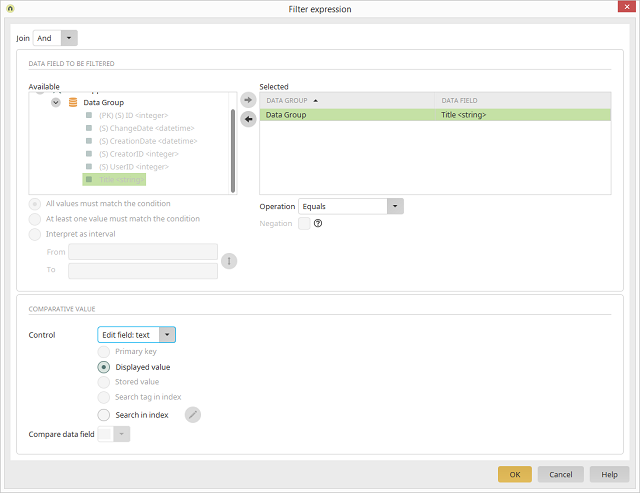 When comparing multiple data fields, you can specify whether all or at least one of the data fields should match the filter expression. This option is available if the comparison should be made with the dynamic filters Value range or Calendar. With this, the interval must overlap or touch the area to be filtered. If, for example, the start date "01/12" and end date "5/12" are specified for filtering tasks, the setting "Interpret as interval" interprets all tasks that start before the 1/12 and are completed within the specified time; plus all tasks that were completed after the 5/12 and started within the specified time. Please note when filtering time periods that a day always begins at 00:00. If you would like to filter the period of 01/08 until 05/08, the filter expression must be ">01/08 and <06/08". so that 05/08 is included in the filter. If this setting is selected, all data, which does not meet the criteria, will be returned as the result. Select the control that contained the comparative value. Compares the data field's value with the LID of the data record. Performs a comparison with the displayed character string in the triggering control. This setting compares the data field's value with the LID of the data record. If a word cloud is selected as the triggering control, clicking on a day will trigger the search for containing posts and the affected element (e.g. a table) will be filtered accordingly. Data fields with the data type integer or string can be compared to edit fields with the control type "Text". If the comparative type "Search in index" is selected, a search configuration and a comparative field must be specified. Opens a dialog where the search configuration can be selected. The text from the control, which is selected in the area "Comparative value", will be transferred to the search configuration. Afterwards, the search result will be returned. Finally, the operator "Is contained in", which is the only possible operator for index search, is checked as to whether the value of the data field to be filtered is contained in the result list. If this is the case, the corresponding data record is shown. Select the data field whose value should be compared. With this setting, only the data records that have the same status as the checkbox of the filter will be shown. With a selected checkbox, all data records will be shown. If the checkbox is not selected, the records will be shown that have the value "false". With a selected checkbox, only the data records will be shown that have the value "true". If the checkbox is not selected, all data records will be shown. For a selected checkbox, only the sets will be shown whose value is "false". If the checkbox is not selected, all data records will be shown. Click here for more information on this subject.